About twenty years ago, my bike was stolen because I had locked it, with a U-lock, to a street sign I didn’t realise was broken. It was a man’s mountain bike, a bog-standard white one I’d bought for £50 out of the local paper. I’d put the U-lock around the bike’s top bar, not the wheel, so the thief just easily slipped the bike away from the sign and, I presume, cycled off. I was unemployed at the time, and couldn’t afford a new bike so was pretty upset with myself. About two months later I was walking along the seafront with a friend when a cyclist passed us – on my bike! 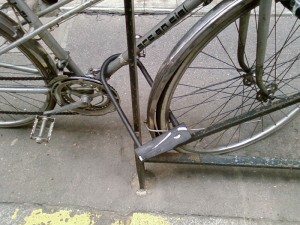 I recognised it right away, and to clinch it, the U-lock was still dangling from the bar. ‘Stop thief!’ I yelled, and began sprinting after the cyclist, leaving my friend standing, baffled on the pavement. The cyclist picked up speed but I was attracting attention and a crowd gathered and stopped him. The cyclist protested that he’d bought the bike at a car boot sale but voila! I produced the key to the U-lock, which was still on my key ring. Once I’d opened the lock, the crowd was completely on my side. He had no choice but to give the bike back and slink away, just as my friend caught up, still completely bemused.